Akzo – The Ultimate Hospital Pass? We doubt that shareholders and potential shareholders of GE are going to come away from this morning’s quarterly earnings and commentary with anything approaching a warm and fuzzy feeling. Poor quality earnings, again; limited free cash, again; headwinds in many businesses, again. As always, not enough information and results that suggest the Industrials businesses are doing better than they really are because they ignore the losses made in the Capital segment, which is now largely project finance and lease related – helping to drive the top line in the Industrial businesses. But worse, a big disappointment from the incoming CEO, in our view, who has decided to take until November before he presents a plan. We were looking for something much sooner given the disappointments at the company and given that Mr. Flannery already has a long tenure at GE and a diverse experience set. We are disappointed by what appears to be a lack of a sense of urgency at best and chronic complacency at worst. Meanwhile – the company has supported the lower end of the guidance range for the year for both earnings and cash flows, resulting in some very ambitious, and frankly hard to believe, targets for 2H 2017, especially if we are not going to see any action from Mr. Flannery before year-end. If we were remotely cynical we might assume that some sort of bold restructuring would be announced late in Q4 – with enough associated charges to completely obscure both 2017 and 2018 underlying earnings – not what the average shareholder wants and likely equally unacceptable to Trian. Current guidance implies that GE will earn 69% of its annual earnings in 2H 2017, versus an historic average of 55%. We have no confidence that this is achievable. Both Ed Breen and Seifi Ghasemi (both outsiders) instituted significant cost programs very quickly after taking the helms of DuPont and Air Products respectively (faster than Mr. Flannery is suggesting) and Mr. Breen had done a transformational deal within 2 months. Mr. Flannery may be setting conservative expectations and may be planning to surprise us on the upside in terms of timing of changes, but for now we are forced to sit and wait and we would not rush into the stock as a consequence. 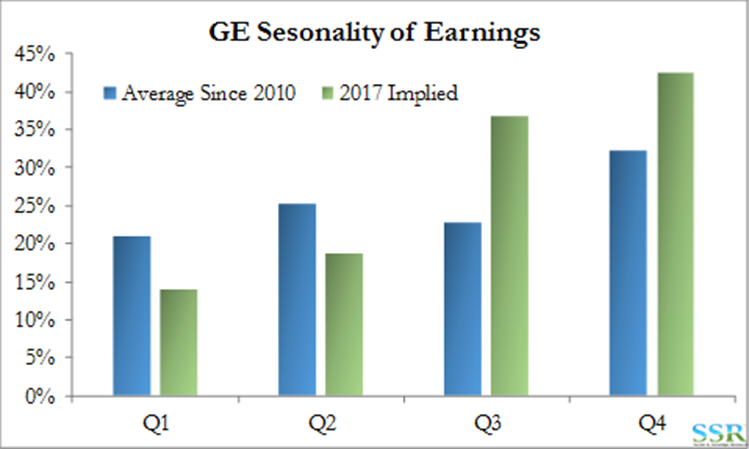 It is unclear to us whether GE can come close to the expectations that have been set for 2H 2017 – if you assume the same quarterly pattern in earnings that the company has seen since 2010, $1.35 per share is a more likely number for 2017. Furthermore, we still have the energy risk, if oil continues to weaken all bets are off for GE’s earnings and cash flows for the balance of the year. For the moment, we have taken GE off our preferred list. The abrupt departure of the Akzo CEO this week has been taken as a moderate positive by investors – we are not sure we understand why. We see this as potentially the worst business “hospital pass” we have seen (though Mr. Flannery’s may be a contender – see above). The phrase “hospital pass” has nothing to do with what may be wrong with Mr. Buchner; and we wish him the very best. “Hospital Pass” is a rugby term and used to describe a pass of the ball to a player, generally from someone surrounded by the opposition, where the receiver of the ball is so exposed to onrushing opponents that he or she is likely to get hit so badly that hospital is the likely outcome. We think that Mr. Vanlancker has just received the business equivalent of a hospital pass. While we hope that all is ok with Mr. Buchner, we do not see his exit as a good thing, as he was generally regarded by European Akzo shareholders as someone who had done well in the role and righted a lot of wrongs at Akzo. It is also not clear that he was opposed to the PPG deal as allegedly his Chairman did all the talking in meetings with PPG and it is the Chairman that Elliott Management is targeting. Mr. Buchner’s exit does not make a deal more likely in our view – it is Mr. Burgmans who needs to leave and even then, given Dutch law, it is not clear that a deal is any closer. Mr. Vanlancker faces a daunting task, which is living up to the promises/guidance that the company gave to investors in defense of PPG – growth rates and profitability targets that do not reflect anything the company has achieved in the recent past. Starting with Q2 2017 – announced next week. As shown in the chart below, while Akzo on average slightly beats quarterly estimates, the range of possible outcomes is very high, especially when compared to PPG and SHW. It would only be a one standard deviation event for Akzo to miss by 17%. Possibly in an attempt to meet revenue growth targets, Akzo has agreed to two small but likely expensive acquisitions already this month – Flexcrete in the UK and Disa in France. We know that it is a sellers’ market in Europe for coatings and related markets so it is likely that Akzo has paid a high multiple for these companies – buying top line growth invariably comes with risk to bottom line and margin targets. 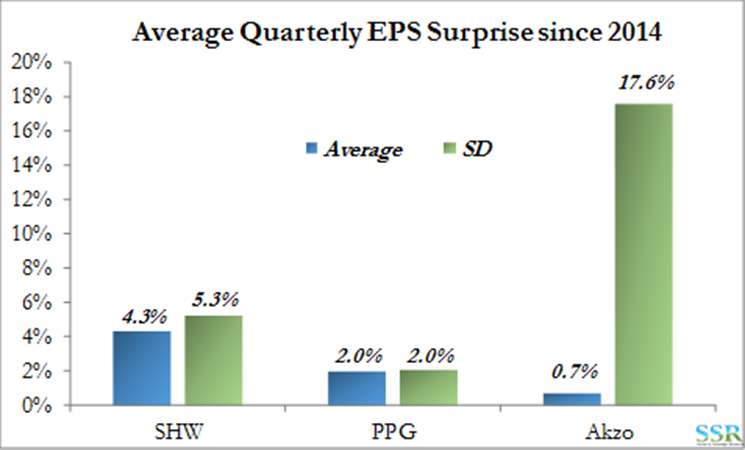 We would argue that SHW put up the worst numbers yesterday, and the less positive outlook, yet SHW outperformed PPG. Despite being significantly more expensive than PPG, SHW has a true following, in part driven by the brand and in part driven by the very high rates of return which, for now, look sustainable. In addition, SHW has a story, the acquisition of VAL and the expected follow-on business opportunities and synergies that come with the deal. PPG, despite significant effort, does not have that story yet, and may have scared investors a little with its guidance to spend as much as $3.5B on acquisitions and share buy-back by the end of the year. The concern may be that – given how much PPG was willing to pay for Akzo – anything the company is now looking at is less attractive from a price and synergy perspective. The changes at Akzo, discussed above, certainly do not suggest any greater likelihood of a deal with PPG – and PPG is clearly pursuing other opportunities as indicated by its agreement to acquire The Crown Group – announced yesterday. We are assuming that Akzo will struggle to meet the projections suggested in its defense of PPG, but there are plenty of strategic iterations that could play from here for Akzo that would exclude PPG. In the meantime, while we believe that SHW is too richly valued we do seem to be isolated in this view. 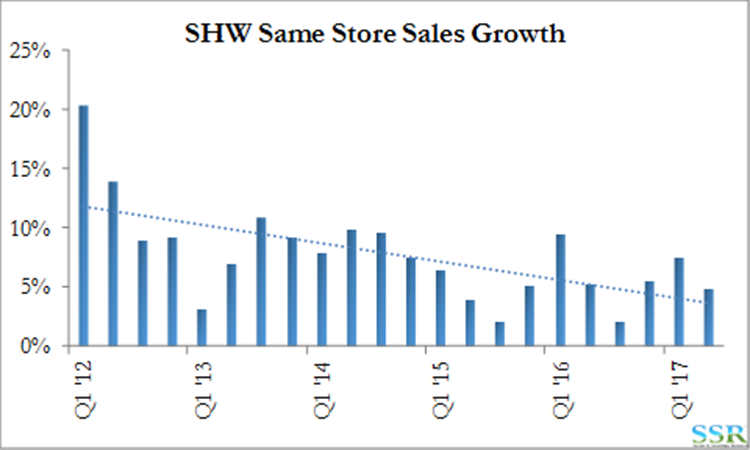 Earnings multiples in the high 20s are not supported by EPS growth of 11% as we saw in Q2, and while SHW now has the potential benefit of synergies from the VAL deal – same store sales growth is slowing (which is part of the reason the company is looking for acquisitions) see chart. While the 21% EPS growth implied in 2018 estimates, and those estimates themselves, certainly justify the current share price, they seem like a stretch to us given the fundamental backdrop, even with the benefit of VAL. PPG is talking about spending significantly on acquisitions in the second half of this year – this comes after a six month failed campaign to buy Azko, which would have been a significant but likely positive step for PPG, giving the company an offset to slower growth – which is plaguing everyone in the industry today. PPG’s EPS was down year on year, reflecting slow growth in many end markets and supporting the need for the company either to chase growth through acquisition and synergies or settle back into a large “buy-back” strategy. PPG trades around 5 multiple turns lower than SHW (based on 2018 estimates), but has only 12% growth implied in 2018 estimates versus 21% for SHW. PPG could use a large M&A deal – or a number of medium sized deals! We remain focused on PPG as the best way into the coatings market either in the US or Europe.